The European Union will need to know “the reason and the usefulness” of any UK request for a delay to Brexit before deciding whether to grant an extension, the EU’s chief negotiator has cautioned. Theresa May is due to write by the end of Wednesday to European Council president Donald Tusk, setting out her proposal to extend the two-year process of negotiating withdrawal under the EU’s Article 50 rules. But a delay in Brexit beyond the scheduled date of March 29 needs the approval of all 27 remaining member states at a summit in Brussels on Thursday. He warned that the UK would need to propose “something new” to justify a lengthy extension, he said. Unconfirmed reports suggest that Mrs May could ask for a lengthy extension to Article 50, with the option of an early break in May or June if she manages to get her Withdrawal Agreement through Parliament. But Mr Barnier appeared to pour cold water on this possibility, telling a reporter: “You said both short and long. He added: “My feeling is … a longer extension needs to be linked to something new. Irish foreign minister Simon Coveney said the UK would need to provide a “very persuasive plan” to go with any requests for a delay to Brexit. 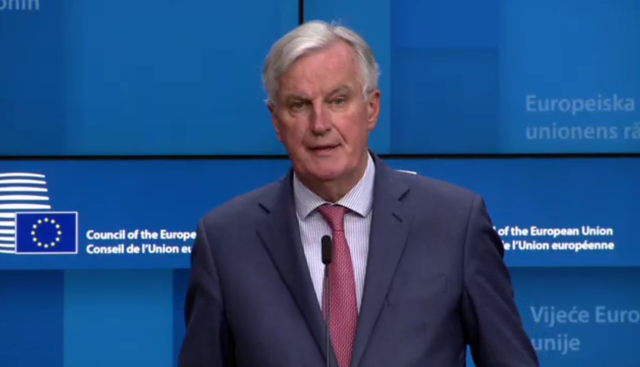 He told reporters in Brussels: “If there is going to be a request for a long extension of Article 50 by the UK then there will need to be a very persuasive plan to go with that to explain why that’s needed and how they will use the time to conclude the outstanding issues that haven’t been able to be agreed in London in the context of the Brexit process. If the EU agrees an extension, Brexit will be delayed by the passage of a statutory instrument through both Houses of Parliament removing the date of March 29 from the legislation. MPs will be given an opportunity in the House of Commons on Monday to debate how the process should go forward. At a meeting of Cabinet in Downing Street, Mrs May voiced her “absolute determination” that MPs should have another chance to vote on her Brexit deal, despite the bombshell intervention of the Commons Speaker. John Bercow provoked uproar at Westminster on Monday when he ruled that the Government cannot bring the Prime Minister’s deal back for a third “meaningful vote” unless there were substantial changes. However, in the course of a 90-minute discussion at the weekly meeting of the Cabinet in Downing Street, Mrs May made clear she wanted MPs to have another vote “as soon as possible”. The Prime Minister’s official spokesman said: “What you can see from the Prime Minister and her colleagues is an absolute determination to find a way in which Parliament could vote for the UK to leave the European Union with a deal. Nevertheless, there was said to be concern among some ministers that Brexit appeared to be slipping away. German Chancellor Angela Merkel said Brexit was in a state of “flux” and that EU leaders will “try to react” to whatever Mrs May proposes on Thursday. Mrs Merkel appeared bemused by Mr Bercow’s decision to block a fresh vote on the basis of a convention dating back to 1604. The Prime Minister has previously said if her deal is not agreed there will have to be an extended delay to Brexit, with the UK staging elections to the European Parliament in May. Downing Street confirmed discussions were continuing with the Democratic Unionist Party, which props up the Government at Westminster, in an effort to build support for the deal after last week’s 149-vote defeat. And Mrs May held talks on Brexit with former foreign secretary Boris Johnson, one of the most strident critics of her Withdrawal Agreement. Neither side would reveal what was discussed. Jeremy Corbyn met leaders of the other opposition parties, but declined to sign up to joint action on a Brexit alternative. Green co-leader Caroline Lucas said the chances of a People’s Vote were “moderately higher” after the meeting, also attended by the SNP, Liberal Democrats and Plaid Cymru. Mr Corbyn also held “positive and detailed” discussions with members of the “Norway Plus” group of MPs. A party spokesman said: “All participants pledged to work together and with others across Parliament to find a Commons majority for a close economic relationship with the EU to break the Brexit impasse and bring the country together. With less than two weeks before Britain is formally due to leave on March 29, there was exasperation among leaders of the remaining EU 27 over the continued deadlock in Westminster. Arriving for a meeting of EU foreign ministers in Brussels, Germany’s Europe minister Michael Roth said: “Dear friends in London, please deliver. The clock is ticking. Meanwhile, Mr Tusk met Irish premier Leo Varadkar in Dublin to discuss the backstop arrangement which both the EU and Ireland insist is necessary to keep the border open. In a joint statement, they said Mr Tusk had expressed “strong and ongoing solidarity” with Ireland and they had agreed they needed to see what proposals would now emerge from London.